Retro garage-punk with less hooks than The Strokes but more bite, The Hives have been one of Sweden's best-kept secrets for several years now. With the retro garage craze sweeping the nation, thanks in part to The Strokes, The Hives are no longer a secret, packing concert halls across the nation. But is it deserved? One listen to Veni Vidi Vicious and the answer is yes. Twelve songs, with the entire record clocking in at a short twenty-eight minutes, every moment is restless, even when the band takes a breather, like on the garage ballad "Find Another Girl". 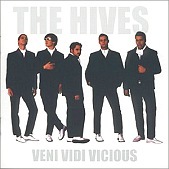 Fierce and sweaty, The Hives pay homage to surf rock, the New York Dolls, The Stooges, and The Ramones during the course of Veni Vidi Vicious. And, with several full-lengths under their belt, The Hives have had time to perfect their craft, creating a sweltering rock sound that is both monstrous and loose. I'll give it an A.